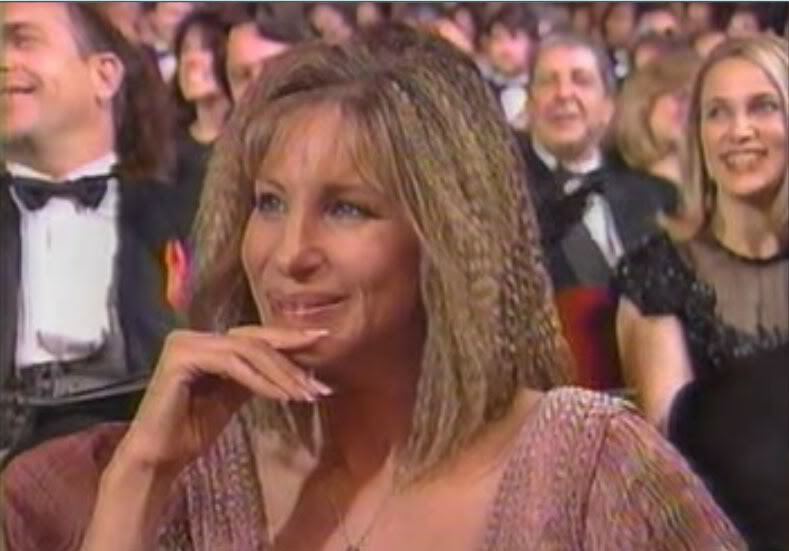 Barbra Streisand at the Oscars 1992. Should the time come that I ever meet Elizabeth Taylor remind me that I am not speaking to her. As you know by now, I haven’t had an “official” party since 1986 and the 3rd Anniversary ‘Yentl’ Party. People still show up on Oscar Night but as the guests didn’t feel the hostess was in the mood for a party, there was no party. I’ve had a lot of non-parties. And Oscar Night ’92 was no exception. As thrilled as we were at the seven Oscar nominations garnered by ‘The Prince of Tides’ the snub of Barbra Streisand by the Director’s Branch was just too bitter a pill to swallow. But we weren’t going to sit around and let the Academy get the better of us. John decided it was time we put all of my “Barbra” and “awards” clips onto one big reel, so to speak. You see, every Oscar Night we would watch our favorite bits and pieces from all the VHS tapes that had been piling up in the 80s and John thought it was time to splice and edit everything together so that we wouldn’t have to hit the eject button every three minutes and insert a new tape. John spent hours sitting in front of a television in front of which he connected two VCRs – one to play, the other to record. An arduous task, no doubt, but John was always up to any technological challenge. The way he had his editing bay configured he was sitting almost on top of the television with his nose inches from the screen. At one point I walked into the room and he said, “I’m Nancy Kerrigan’s mother.” Look it up. The very last clip he spliced onto the main tape was of Bette Davis at the Golden Globes a few years previous when she presented the Best Picture Award to ‘Out of Africa’. We loved how she almost forgot to mention ‘Witness’ as a nominee and John had some fun with this…he purposely left out the announcement of the film hoping that later that night we would hear ‘THE Prince of Tides’ announced as the victor at the Oscars. When Elizabeth Taylor and Paul Newman walked out on stage I saw the writing on the wall. It was going to ‘Silence of the Lambs’ and we had better get used to it. I was still beaming from Jessica Tandy’s lovely introduction to the clip of ‘THE Prince of Tides’ so I was relatively calm. I heard the word ‘The’ and my heart stopped. My knees jackknifed me out of my seat and my arms went up into the air. Tears of joy were about to hit my lashes. I was aware of the people around me moving in slow motion, as they too got ready to celebrate. I was so proud of Barbra. I forgave the Academy everything; it was all about to pay off with this win for Best Picture. I could not wait to see Barbra walk the stairs in humble triumph. Why was I seeing Elizabeth Taylor’s teeth? That’s not the way you pronounce “P”(rince). Why does it look like she’s saying “S”(ilence)? And then I heard it – “of the Lambs”. Did Barbra change the name of her movie? Was ‘The Prince of Tides’ now called ‘The Silence of the Lambs’? And then it hit me. We lost. But that’s not what pisses me off. This is what upsets me most. For fifteen months I had heard about ‘Silence of the Lambs’ this, ‘Silence of the Lambs’ that. I never once, not once, heard the word ‘The’ as part of title. Never, ever. Even Paul Newman didn’t say it when he read the lit of nominees. ‘The Prince of Tides’ was clearly called ‘The Prince of Tides’. I don’t think there is any argument with that. Why did Elizabeth Taylor have to use the word “the”? Why, of all nights, did they decide to use the full title of ‘Silence’? And why did she pause so long after the word ‘the’? She let it linger in mid-air and got me out of my seat with a scream in my throat and then she doesn’t say ‘Prince of Tides’? Am I going crazy? Why did she wait so long? Well, I had the occasion recently to re-watch the tape of that night. Miss Elizabeth Taylor does not pause between words. She says it all rather quickly as a matter of fact. My mind was playing tricks on me. I really thought there was a long pause between words. Why did I react so fast? I must be going crazy. Maybe Dan Quayle is right, “The mind is a terrible thing. Let’s not waste it.” Sorry Liz. 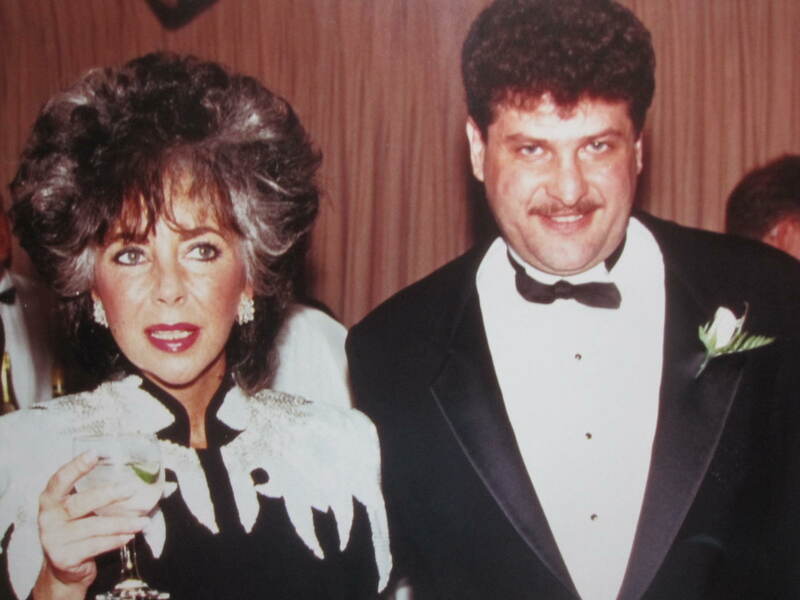 Well, Michael Mayer loved Elizabeth Taylor most of all. She was his all-time favorite person. Sometime in the late 80s, Miss Elizabeth Taylor graciously poised for a picture with Michael when he was hosting some gallery opening or some such. Elizabeth Taylor and Michael Mayer, Los Angeles, 1980s (mid to late). So I forgive her. And I will speak to her. But I just hope she doesn’t start any of her sentences with “The”. Joeseph – the photo of Elizabeth and your friend was taken the night of November 15, 1984. I don’t remember the name of the gallery on Rodeo Drive, but there was a special showing of works by Erte’. Elizabeth went home with one of his pieces. Thank you. (Very much.) I don’t remember if I mention it in this chapter (20) but Michael worked in a gallery (Dyansen) in New York which sold Erte’. This is wonderful to have the date. Thanks again. Gosh! I commissioned a piece, an Elizabeth Taylor as Cleopatra, from a very talented artist named Clark Hanford through the Dyansen Gallery. I first saw his work in the very same gallery on Rodeo Drive where the photo of Elizabeth and Michael was taken!! If memory serves me, I inquired about the artist at the gallery on Rodeo Drive, and they gave me the contact information for him through the Dyansen Gallery. I travel to NYC quite often, and visited the Dyansen Gallery a few times as a result of the commission. Small world, huh? Very small world. And Michael and I met Bill for the first time one early morning before sunrise standing on line for “The Little Foxes” the day single performance (non-subscription) tickets went on sale.